The MAB 38 (Moschetto Automatico Beretta Modello 1938), Modello 38, or Model 38 and its variants were a series of official submachine guns of the Royal Italian Army introduced in 1938 and used during World War II. The guns were also used by the German, Romanian, and Argentine armies of the time. Soldier of an assault Battalion of the Republican National Guard (GNR) of Repubblica Sociale Italiana, armed with a MAB 38A and wearing a "Samurai" magazine-holding vest. Originally designed by Beretta's chief engineer Tullio Marengoni in 1935, the Moschetto Automatico Beretta (Beretta Automatic Musket) 38, or MAB 38, was developed from the Beretta Modello 18 and 18/30, derived from the Villar Perosa light machine gun of World War I. It is widely acknowledged as the most successful and effective Italian small arm of World War II and was produced in large numbers in several variants. Italy's limited industrial base in World War II was no real barrier toward the development of advanced and effective small arms, since most weapons did require large amounts of artisan and semi-artisan man-hours to be fine-tuned and made reliable by default. Italian specialized workers excelled and the initial slow rate of production meant that the MAB 38 became available in large numbers only in 1943, when the fascist regime was toppled and Italy split between the Allied-aligned co-belligerent forces in the south and German collaborationists of the Italian Social Republic in the north. The MAB 38 was developed by Beretta to compete in the rich market of machine and sub-machine guns; it was a well-made and sturdy weapon, introducing several advanced features and was suitable for police and special army units. Presented to Italian authorities in 1939, its first customer was the Italian Ministry of Colonies, which purchased several thousands MABs to be issued as standard firearm of the Polizia dell'Africa Italiana (Italian Africa Constabulary), the government colonial police force. Army orders were slow to come; although impressed by excellent qualities and firepower of the weapon, the Italian military did not feel the MAB was suitable for standard infantry combat. It was judged ideal for police and assault units and in the beginning of 1941 small orders were placed for Carabinieri (military and civilian police), Guardie di Pubblica Sicurezza (national state police), and paratroopers. The Italian Army requested minor changes to reduce production costs, notably the changed shape of the recoil compensator and the removal of the bayonet and catch as the MAB 38A. This was the standard army variant, used throughout the war and issued to elite Italian units, paratroopers, Alpini "Monte Cervino" assault battalion, 10th Arditi Regiment, "M" Battalions of Milizia Volontaria per la Sicurezza Nazionale (MVSN, Blackshirts) and military police. The Italian Royal Navy also purchased the type and MAB 38A were given to the "San Marco" Marine Regiment and naval security troops; The Regia Aeronautica (Italian Royal Air Force) issued the MAB 38A to its crack A.D.R.A. Regiment. Orders were still small and the Carcano M1891 rifle remained the standard weapon even in elite units. Until 1943, MAB 38A (and since 1942, the MAB 38/42) was available almost exclusively to paratroopers, Blackshirts, tank crews and Carabinieri military police, given the need of all of the former to express high volumes of firepower in prolonged actions or to keep close-quarters combat superiority. The paratroopers of the 185th Airborne Division Folgore was armed exclusively with the weapon. Blackshirt legions (one per infantry division) were regarded and used as elite assault units both for their fanaticism and their Beretta 38s. After the Italian armistice of September 8, 1943, the Italian armed forces melted away and an Italian army was reconstructed in northern Italy under German sponsorship, the Beretta MAB equipped many units. The Italian Social Republic (R.S.I.) army fought a guerrilla war against partisans from the start, as well as against the Allies. For assault and counterinsurgency units, where firepower at close range was a vital asset, it was the ideal weapon. Production of the MAB became priority and it was supplied in great numbers to R.S.I. formations, especially elite units and it became an iconic weapon, symbolizing the Italian soldier in popular culture. Later in the war, a simplified variant known as the MAB 38/44 was introduced. Regardless of the tables of organization and equipment of a unit, the Beretta 38 was a popular weapon that could eventually find its way into the hands of virtually any soldier, especially amongst officers and higher non-commissioned officers, in any type of unit. 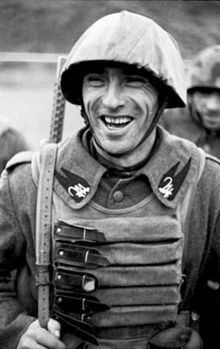 A magazine-holding vest was designed for elite troops (Blackshirts, paratroopers) armed with the Beretta 38; these were dubbed "Samurai" due to the similarity of the stacked magazines with traditional Japanese armour. A special canvas holster was issued with the MAB with two magazine-carrier pouches sewn on, to be worn as a belt but only came into use during the brief life of the R.S.I. and by then could be seen in the employ of many different units whose "elite" status could have been reasonably questioned (such as Black Brigades and other militias). The Beretta MAB was highly praised by Italian resistance movement fighters as well, being far more accurate and powerful than the British Sten which was common issue in partisan units, although the smaller Sten was more suited for clandestine operations. German soldiers also liked the Beretta MAB, judging it large and heavy, but reliable and well made. The 1938 series was extremely robust and proved very popular with Axis forces as well as Allied troops, who used captured examples. Many German soldiers, including elite forces such as the Waffen-SS and Fallschirmjäger forces, preferred the Beretta 38. Firing a powerfully loaded Italian version of the widely distributed 9×19mm Parabellum cartridge, the Cartuccia 9 mm M38, the Beretta was accurate at longer ranges than most other submachine guns. The MAB could deliver an impressive firepower at close range and at longer distances its size and weight was an advantage, making the weapon stable and easy to control. In expert hands, the Beretta MAB allowed accurate short-bursts shooting up to 100 m (110 yd) and its effective range with Italian M38 ammunition, was 200 m (220 yd)s, an impressive result for a 9 mm submachine gun. MAB 38, in its first variants, was a fine weapon by any standard, crafted with high quality materials, flawlessly finished and with carefully machined parts. Models 38/42 and 38/44 were easier and faster to build, the finish was sacrificed for speed of production but the quality remained high. The mechanism was a traditional simple blowback recoil but with a novel floating firing pin, an automatic safety on open bolt (both later removed to save production costs), a recoil compensator on the muzzle, a bolt cocking handle with sliding dust cover and a striking trigger gear with no fire selector but with two triggers instead; the fore trigger was for semi-automatic fire and rear trigger for full-auto. The user could shift quickly between methods without switching levers or safety catches, which proved useful in combat. The full-auto trigger a safety catch on left side, which was eliminated from 1942 and the rear sight was adjustable up to 500 m (550 yd) in the MAB 38 and 38A, the 38/42 and 38/44 variants had fixed rear sights. The MAB 38 had a wooden stock, was about 800 mm (31 in) long and weighed about 5 kg (11 lb) when loaded, with an effective range of about 200 m (220 yd). The Model 1938 can be recognized by its machined steel receiver, fine craftsmanship and finish and by the perforated cooling jacket over the barrel. It was produced from 1938 to 1950 and fired 9×19mm Parabellum ammunition at 600 rounds per minute. It used 10, 20, 30 or 40-round magazines; the short 10-round magazine, when used in conjunction with the fixed bayonet, was popular with Allied and Axis forces for guarding prisoners or internal security. In combat, the 30 round magazine was the most common. 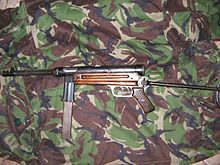 The original MAB 38, first issued to Italian police in 1939, had a bayonet mount and stock rest for the Carcano M91/38 folding bayonet. In compliance with Italian army requirements, bayonet mount and rest were eliminated and the recoil compensator was redesigned, the two horizontal muzzle slots substituted by 4 transversal cuttings, judged more effective. This standard army variant was renamed MAB 38A and issued in 1941. Despite its undeniable effectiveness, the Beretta Model 38 proved too time-consuming and expensive to produce during wartime. Marengoni designed a simplified model made from sheet steel, in which the cooling jacket and bayonet mount were eliminated and the separate firing pin mechanism replaced by a fixed firing pin machined on the face of the bolt. The barrel and wooden stock were also shortened to save weight and cost. This new model the Model 38/42 had a fluted barrel to aid cooling and save weight. It also had a slower rate of fire (550 rpm). The Model 38/43, was an intermediate production stage between the 42 and 44 patterns. The 38/42 and 38/43 were adopted by the Wehrmacht as the Maschinenpistole 738(i), abbreviated as MP.738. Models produced for the German Army received German aceptance marks. The Model 38/44 was a minor revision of the 38/43, in which the bolt was simplified and a large-diameter recoil spring used in place of the operating spring guide. It also eliminated the fluting to save time and increase production. The 38/44 was also adopted by the German army as the MP.739. A variant of the Model 38/44 was fitted with an MP40-style under-folding stock as the Model 1. After World War II, the 38/44 continued in production in slightly revised form as the 38/49 series: the Model 2 or MP 38/44 Special with an MP40-style under-folding stock and extended magazine well, the Model 3 with an extended magazine well and telescoping steel-wire buttstock and the Model 4 with a standard wooden rifle stock. All of these models have a push-button cross-bolt safety catch at the middle of the stock After Marengoni's death, Beretta engineer Domenico Salza revised the safety system of the Model 38/49 series as the Model 5, identified by a large rectangular grip-safety button located in the stock's finger groove. The Model 5 was produced for the Italian Army, police and the armed forces of several other nations until 1961, when production ceased in favor of the compact, modern Beretta M12. Empire of Japan: 350 ordered and 50 delivered in 1943. Finland: Italian surplus MP38s bought in 1958. Indonesia: MP1938/49 variant. Deployed during the United Nations Operation in the Congo. Somalia: Used by Western Somali Liberation Front rebels during Ogaden War. Romania: 5,000 ordered in 1941 and delivered during 1942. Received both Model 38A and Model 38/42. Yugoslavia: Captured in vast quantities. ^ a b Abbot, Peter (February 2014). Modern African Wars: The Congo 1960–2002. Oxford: Osprey Publishing. p. 44. ISBN 978-1782000761. ^ JWH1975 (September 27, 2015). "StG-44 in Africa after WWII". WII after WII. Wordpress. Retrieved April 3, 2018. ^ a b c d e f g Iannamico, Frank (June 1998). "Moschetto Automatico Beretta 38/42". Small Arms Review. Vol. 1 no. 9. ^ a b Miller, David. Fighting Men of World War II, Volume I: Axis Forces--Uniforms, Equipment, and Weapons (Fighting Men of World War II). Stackpole Books. pp. 139, 353. ISBN 0-8117-0277-4. ^ Ordnance Went Up Front, p. 58: "No one ever bothered with any other kind of submachine gun if he could get hold of a Beretta M38, and keep it. The New Zealand boys especially loved them. Even the Germans liked it, and they hated to admit anything was good except their own stuff". ^ "Moschetto Automatico Beretta". historiamilitaria.it (in Italian). Marco Marzilli. Retrieved 8 September 2015. ^ Windrow, Martin (1997). The Algerian War, 1954-62. Men-at Arms 312. London: Osprey Publishing. p. 37. ISBN 978-1-85532-658-3. ^ a b c d e Jones, Richard (2009). Jane's Infantry Weapons 2009-2010. Jane's Information Group. pp. 894–905. ISBN 0-7106-2869-2. ^ "ITALIAN-JAPANESE MP 38/43 MACHINE PISTOL". Dragons of Fire. Retrieved 2011-12-10. ^ Thompson, Leroy (23 Mar 2017). The Suomi Submachine Gun. Weapon 54. Osprey Publishing. p. 73. ISBN 9781472819642. ^ a b Bishop, Christ (2002). The Encyclopedia of Weapons of WWII: The Comprehensive Guide to over 1,500 Weapons Systems, Including Tanks, Small Arms, Warplanes, Artillery, Ships, and Submarines. Metrobooks. p. 262. ISBN 1-58663-762-2. ^ Jowett, Phillip (2001). The Italian Army 1940-45 (3): Italy 1943-45 (Men-at-Arms) (v. 3). Osprey Publishing. p. 17. ISBN 1855328666. ^ Vuksic, Velimir (2003). Tito's Partisans 1941-45. Osprey Publishing. p. 60. ISBN 1841766755. Beretta A5 SMG Brochure (PDF) (in Italian). Gardone Val Trompia, Italy: Pietro Beretta S.P.A. Retrieved 8 September 2015. Wikimedia Commons has media related to Beretta MAB 38.